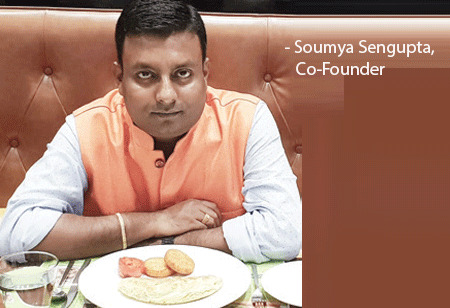 Two hospitality graduates and foodies by nature - Soumya Sengupta and Dibyendu Ghosh were serving the hospitality industry for quite a long time. During this tenure, they noticed the lack of professionalism in the vast food industry, especially in the eastern part of the country. Digging deep, they understood that the root cause of the problem was not at the operational level but at the basic planning stage. They started studying more about hotel and restaurant planning and delving deep into the working of this industry in different parts of the world. Once they were ready with the necessary repertoire, they quit their jobs and zeroed in establishing their own venture – which they named as Resotel. “Almost everybody visits a restaurant or stays in a hotel.It is but natural that a prospective investor, himself being a consumer, tends to think that the subject is more or less known to him and does not approach an expert for planning the multiple facets of the business. We do not just provide design and operation to our clients but meticulously educate them about every nuance of the hospitality business,” speaks Soumya. designing the kitchen, specifications of equipment, curating the menu, menu pricing, menu presentation to controlling entire food and beverage and strategic planning; we do it all,” he says. Resotel has a passionate and dedicated team which provides best hospitality solutions to their prestigious clients. The team has an intense and zealous passion for their work which is enough to make any business successful. As hospitality consultants, team Resotel works for a project that is related to hospitality especially food and beverage. It has worked for clients in several parts of the world and for businesses in all sectors of the hospitality industry, with varying degrees of complexity. “We can provide technical and advisory support services and work with the architects and various consultants to come up with a product in line with the owner’s vision and budget,” Soumya mentions. "Resotel has a passionate and dedicated team who provides best hospitality solutions to their prestigious clients"
Team Resotel has, till date, undertaken projects for 5-star hotels, resorts and lounges. “Loungers and pubs are our key areas of services. Earlier Kolkata had only three breweries. And out of that three, two were done by us,” he asserts. Some of their projects include Ethnotel, Fly Kouzina, Raize the Bar – Brew Pub, Hashtag in Siliguri, The Signature in Asansol. The company is present in four countries namely Oman, Bhutan, Nepal and India. “We started with one city and today we are in eight cities, four countries and have completed 70 projects in the past five years,” concludes Soumya.